A couple of examples where Protected Links might be useful are: sharing pre-incident plans with mutual aid departments, providing access to your reports though your MDT or other third party applications, sharing your post-incident analysis report with neighboring jurisdictions. When you choose to create a protected link IncidentSmart will generate a difficult to guess website link. You can then copy this link and share it with anyone who you want to have access to your report. People with the link will be able to view the report. Due to the length and complexity of the link it is virtually impossible for someone to guess the link and access your report without being told what it is. 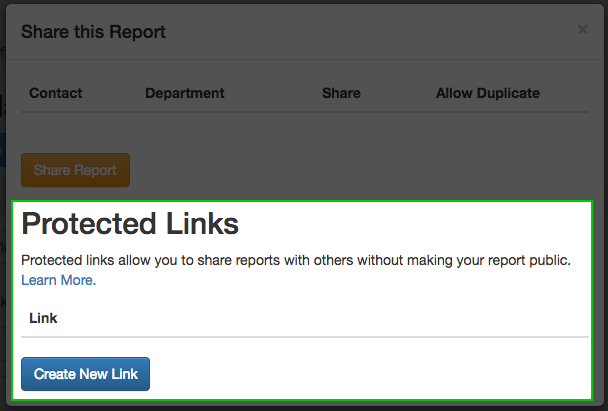 To create a protected link open up one of your reports and click the share button. The sharing panel will open up. At the bottom of the panel you will see the new Protected Links section. Clicking on the Create New Link button will immediately create a new protected link which will show up in the list above the button. You are able to click the green copy button and the link will be placed into your computer's clipboard. You can now paste it into an email, text message or save it to some other location. If the usefulness of the protected link has ended or you want to disable access through the protected link just press the delete button and the protected link will be removed and access revoked. You are able to create as many protected links as you need in order to have finer control over access to your reports.